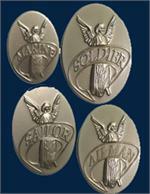 Unique collectible from Stars and Stripes features members of each military branch saluting America's flag. 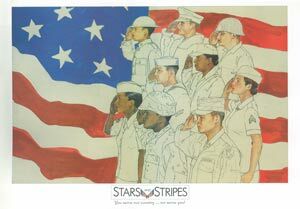 A small number of these handsome limited edition prints are available signed by the artist, Danny Vaughn, a former Stars and Stripes staffer. (Prints are also available unsigned). Beautifully reproduced on high quality stock, each print measures 24" wide x 17" high; image area measures approximately 15.5" high by 21.5" wide. Prints are rolled and shipped in a tube for maximum protection.